All gallons of fuel should be created equal. But of course, they're not. Five cents higher one day, ten cents higher the next. At Melloy Dodge, we can't guarantee the price of fuel, but we can guarantee the gallons. 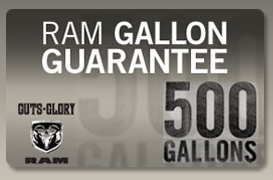 So Ram Trucks will be giving away one grand prize of 500 gallons and weekly prizes of 32 gallons (the largest available size fuel tank on the new 2013 Ram 1500). And if you drive a new 2012 Ram 1500, you'll get excellent efficiency. So every gallon goes further. Here's to fuel quality. For more information and to sign up to win, click here.